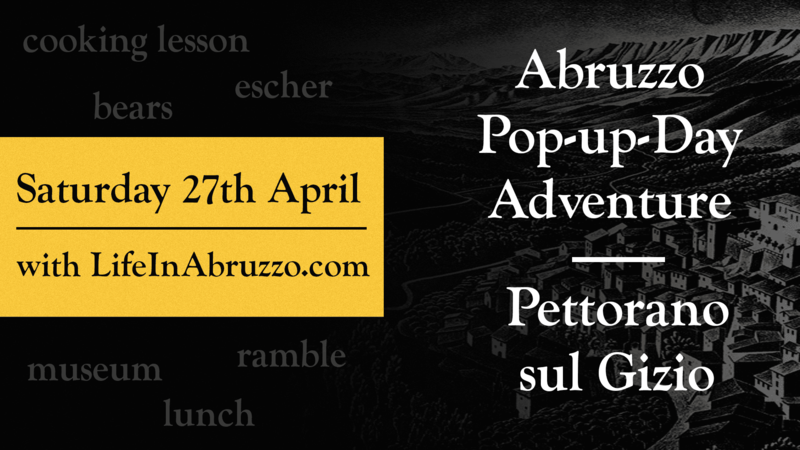 A pop-up day of adventure on Saturday April 27th in one of Italy’s officially most beautiful fortified towns that sits on Abruzzo’s best wildlife corridor. Pettorano sul Gizio is officially listed as one of Italy’s ‘Borghi Piu Belli‘ (Most Beautiful Small Towns) and sits above the Gizio River , neatly sandwiched between the Abruzzo, Lazio and Molise National Park (PNALM) and the Majella National Park, two of the most important protected natural areas in Italy. We’ll be having a very special cooking lesson that embraces the charcoal-making history of the town and helps create tasty dishes for you to make easily back home whilst sampling unique local dishes over a seasonal 3-course lunch. 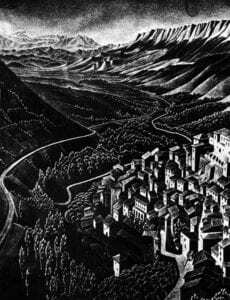 Our passeggiata, the traditional Italian post lunch walk, will be a cultural guided walk through the town which is one of Europe’s oldest inhabited, (Paleolithic) areas, up to ‘Belvedere ‘, the panoramic point made famous by the Dutch graphic artist and engraver, M CEscher. 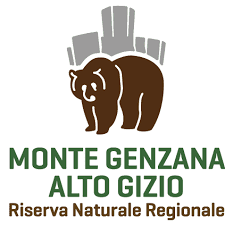 This will be followed by a ramble in the ‘Riserva Naturale Monte Alto Genzana’, that stretches from the river (530 masl) up to the summit of Monte Genzana (2170 masl), from where if you are a climber, local Marsican bear or wolf you can see the Adriatic coastline. There’s an opportunity to stay overnight at the Nature Reserve’s co-operative guest house on the river for those who are interested. We’ll be starting the day with a coffee, fruit juice and delicious home-made local cake baked by our culinary hosts Ristorante Il Torchio that fronts the town’s main renaissance piazza. 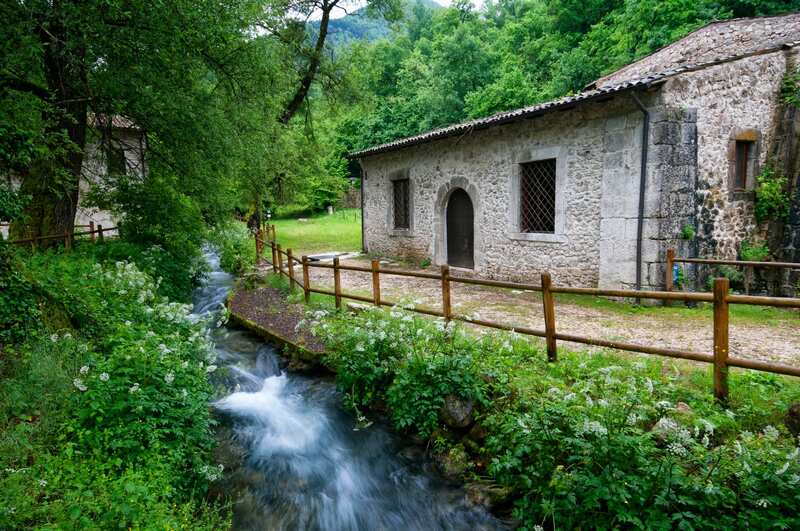 We’ll have an easy and stunning walk along the Gizio River to begin our cooking lesson with a dip back into history at the Industrial Archaeology Park. This is scenically set among botanical gardens, willows and black alders. Its water mills date back to 1577 and were used to grind corn for the local polenta dish, ‘Polenta Rognosa’, a tasty portable carbohydrate base served in slices and the former main diet of the town’s men who were charcoal burners. This is now the centre point to their sagra famous throughout Abruzzo! We’ll return to Il Torchio to learn how to create this polenta dish and find out how to transform their traditional copper cauldron methods into modern kitchens whilst creating a number of authentic and healthy local toppings that will please meat-eaters and vegetarians alike, whilst providing a number of opportunities for those who love a taking a bit of food photography. A scrumptious, extensive but very leisurely 3-course lunch will be served by our hosts showing off wonderful local dishes, created with an emphasis on 0 km ingredients and including local wine, coffee and local liqueurs. Our gentle ramble will explore some of reserve’s diverse and rich vegetation and environments, from up past the river into the mixed oak woods and touching on the higher altitude beech forests. This is home to Marsican bears, wolves, deer, roe deer, wild boar, beech martens, badgers, dormice, hares and squirrels. Among the birds that live here are eagles, falcons, buzzards and herons. If you particularly love butterflies this is the place! 116 types of butterfly out of the 131 in the whole of central Italy can be found here. We’ll discover more on how the reserve and the town is working with the the Marsican Bear charity, Salviamo l’Orso and how the town is now a bear smart community (Bear Smart Community Genzana (BSCG)). The aim is to reduce conflict between humans and the critically endangered Marsican bears bears by educating, supporting and financing the local communities with tools like electric fences to ensure both co-exist peacefully. 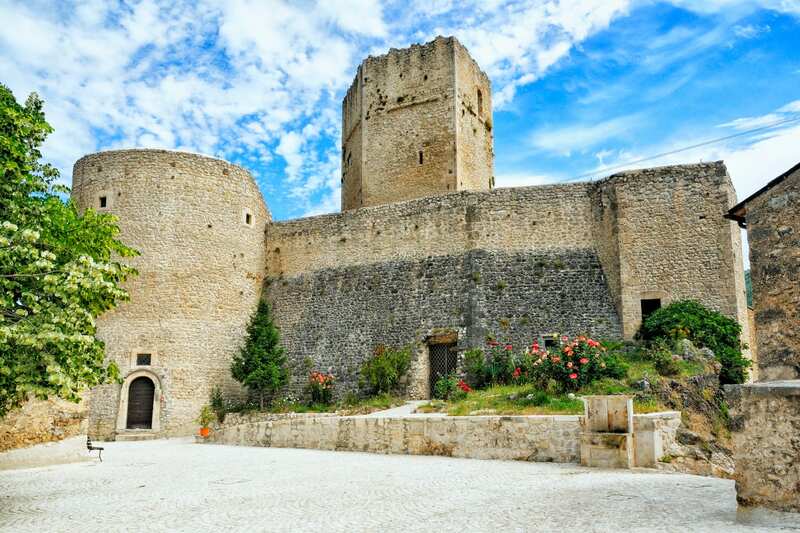 The price includes all beverages and foods listed in the itinerary, all museum and castle entrance fees, an Italian & English speaking guide and Eventbrite ticket booking fee. Tickets can booked securely on Eventbrite using all major credit and debit cards. Free parking is available nearby for those who are driving themselves. If there are 5 people who would like to be picked up by an insured minibus service we can arrange this with return tickets from Pescara Station for €24, Sulmona Station for €4. Please let us know if you require after you have booked and we will arrange. For those that would like to stay the night either the night before or on the day, the Nature Reserve can provide accommodation in their own co-operative guest house, ‘Ju Pajare’ that overlooks the Gizio River. There are 3 rooms each with a private bathroom and a shared kitchen, price €30 per person or €45 for a single room. If you would like to book let us know and we can arrange this for you, which you will need to pay on the day invoiced by the Nature Reserve.